Below are 50 of my favorite quotes on traveling compiled from all over the net. I especially like the first one, but I feel all of these quotes reflect either the reasons why we travel or what we should aspire to be when we travel. Enjoy and do leave a comment if you agree or disagree with them.Also, do you have your own quote that you would like to share? Add them in the comments section. 1. Ask for the name of the tour agency who will do the actual tour. Some are just agents / resellers for another company. 2. Look for the cheapest price, but compare the inclusions. Some agents may sell the same tour for a higher price, but you'll get the same service/ quality. 3. Ask what is included. A cheaper price may not include a boat tour. 4. Ask how many stops are there to shop, and what kind of shops are included. It depends on what you're after for, be it painting, carving, silk, etc. 5. Ask what boat tour is included. There are two types: paddle boat and motorized long tail boat. 6. If motorized boat is included, ask what is the area covered. Ideally, you'll see the community and some canals away from the market. 7. Ask what kind of car/van will be used. Though using a bus may be cheaper, it would mean a lot of wasted time waiting for more people. Confirm that the AC would be working well, too. 8. Ask for a guarantee and tell them you will demand for a refund if the terms are not met. This will encourage them to be honest about the trip, and allow you to decide if the trip is worth the price. 9. Ask around, ask at least 4 agencies before you decide. 10. Do not be ashamed to ask. If they are not accommodating, that is already as sign of poor service during the actual tour. Move to the next agency. There are hundreds of them. Are you planning for a trip to Damnoen Saduak, Thailand's famous floating market, but is unsure whether to book a tour in Khao San or to do it yourself? Here's a guide for you. For my second task as part of Bangkok 2012 Challenge (details here), I need to go to Damnoen Saduak, Thailand's most famous Floating Market, for less than 300 Baht. Usual tours from Khao San would range from 300 Baht to 600 Baht, and this includes only transportation to and from the floating market plus a 20 minute long-tail boat ride around the community. You would have to pay extra for a paddle boat tour around the actual market (100 - 150 Baht, shared). Since this is only a half-day tour, leaving Khao San at around 7 AM and you'll be back usually at around 1 PM, no lunch is included. That means you'll have to pay for your own food while in the market - and there's plenty to choose from. This is actually my third time to visit the floating market. The first two was through a tour agency booked in Khao San. Since there are plenty of competing tour operators, each trip is different. Some include a trip to the Snake Museum, others stop at various cottage industries (silk, painting, carving, etc). But my trip to Bangkok would not be complete without a trip to the floating market. I want to go back for one reason: FOOD. Specifically, I'll travel 110KM from Bangkok in search of the world's most delicious ice cream. Well, almost. But it's so good, I'm literally salivating on the way there, and I usually end up ordering 3 to 5 servings for every visit. In fact, I'm such a fan the ice cream vendor knows me even if I just visit once a year. So, is it possible to go to Damnoen Saduak under 300 baht? 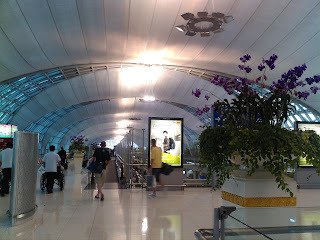 For my stop-over going to Mumbai, I was choosing between Singapore (via Singapore Air) or Bangkok (via Thai Airways). Singapore was cheaper by about 100 USD, but I still ended up choosing Bangkok. Tuktuk drivers waiting for tourist to bring around the city. This is the nth time that I am visiting this beautiful city, so to make this trip more exciting, I've decided to embark on a challenge: To survive in Bangkok for 3 Days/ 2 Nights for only 1500 baht (roughly PhP 2,000 or 50 USD).